COLUMBUS — Nearly 50 percent of older adults report using seven or more medications while remaining active drivers, according to new research from the AAA Foundation for Traffic Safety. Many of the medications have the potential to significantly increase crash risk. Currently, a record 42 million adults, ages 65 and older, are driving on America’s roadways, and this number is expected to increase substantially over the next decade, making seniors the largest driving population. The AAA Foundation, along with researchers from Columbia University and the University of California, San Diego, evaluated medication reports from nearly 3,000 older drivers participating in the AAA LongROAD study. Researchers found that the most commonly reported medications used by older drivers affect driving ability and increase crash risk. Previous research from the AAA Foundation for Traffic Safety found that fewer than 18 percent of older drivers report ever receive a warning from their health care provider about how their prescriptions impact their safety on the road. Additional data from the American Society of Health System Pharmacists shows that 34 percent of older adults are prescribed medications by more than one doctor, possibly bypassing opportunities to check how the new prescription may interact with other medications being used. 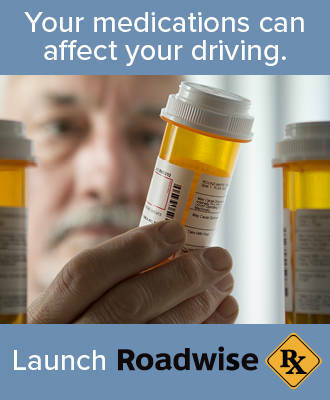 To learn more about their medications, drivers can use AAA’s RoadwiseRx.com. It’s a free, online tool to help drivers and their families understand common side effects of prescription drugs, over-the-counter medications and herbal supplements. It also flags interactions between these medications that can impact safety behind the wheel. Print the free list and report, then discuss the confidential results with your doctor or pharmacist to learn how to mitigate possible crash risks. Drivers seeking additional ways to stay mobile or looking to drive less often due to their medications can find resources for alternative transportation at SeniorDriving.AAA.com. Kimberly Schwind is a senior public relations manager at AAA Ohio Auto Club.